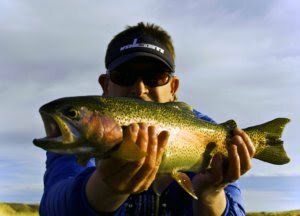 March fly fishing has been lights out in Wyoming! Bureau of Rec. has finished with the spring flush on the Bighorn River in Thermopolis and it is looking good. We have been catching fish on eggs, hothead pine squirrel leeches/small streamers, and annelids. Rainbows are on their spawning beds or redds, so please practice caution and don’t “poach the redds.” There are plenty of fish to catch this time of year without disturbing crucial trout habitat. The fly fishing guide season has kicked off and we are busy on the water. 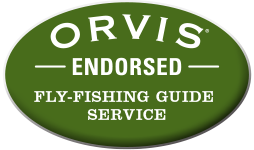 We always enjoy creating a wonderful and rewarding fly fishing experience for all anglers. 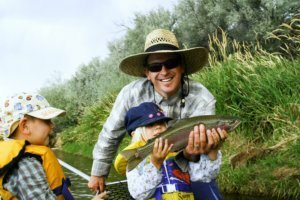 With four generations of Wyoming fly fishing experience, we will put you on the fish and offer a historic perspective not found in other guides. In the works, Trout TV will be out this summer to shoot a segment on Dunoir Fishing Adventures and the waters we fish. Keep posted. March has definitely brought much warmer weather and less wind. The Bighorn River in Thermopolis has been fishing very well. Flies have ranged from annelids, streamers, and egg patterns. A lot of fly fisherman and drift boats have been on Wedding of the Waters with the warm, longer days. There are plenty of fish to be had by all if you know where to look for them. We are gearing up for a busy season to come. Summer is booking up fast, so be sure to get your fly fishing date set with Dunoir Fishing Adventure guides. With 27 years of fly fishing experience in this region, we know how and where to take you fishing. 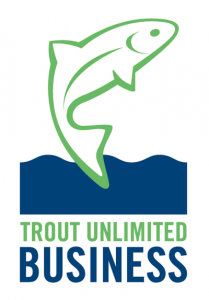 We are not limited to one river, ensuring that we have plenty of options and opportunities to catch a fish. We will be putting a multi-day discount package out soon, so stay posted. 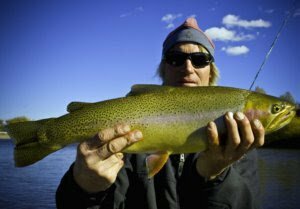 Nothing beats fly fishing in February in Wyoming! Russ and I had a great day on the Wind River yesterday exercising the StreamTech Green Drake fishing raft. It is so nice having the means to use different boats for different waters. Sow bugs were the ticket for catching fish yesterday. Russ stuck this Brown almost immediately. The wind ended up picking up and ended our fishing a bit early. I have never seen so many tumbleweeds floating down the river ever. Guess that is why they call it the Wind River. Not long until Spring is here. Wedding of the Waters has also been fishing well with standard winter flies: streamers, hotheads, midges, and the occasional dry. The blue winged olive hatch has been very strong this past week! Have cabin fever yet? If so, it is time to go fishing! Don’t let a little cold weather and ice slow you down. 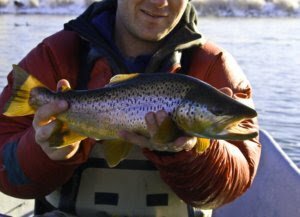 Fly fishing during Wyoming winters can be very productive and fun! 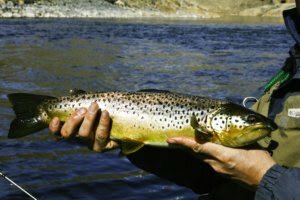 We spend most of our time guiding and fishing on the Bighorn and Wind River in Thermopolis and Dubois, Wyoming. If you just can’t get out, check out this fly fishing video shot by Brad Marlow, owner of Marlow’s Fly Shop, in Dubois, Wyoming. The next time you are in Dubois be sure to check out this fly shop on Main St. Currently, we are offering a Winter Fly Fishing Drift Boat Special, one angler or two, for $350 with lunch, tippet, flies, and instruction provided! Winter time is our favorite season to fish with less crowds and a lot of big fish needing to eat. The Bighorn River in Thermopolis is fishing well right now. Standard winter flies are starting to be productive again. We like to use scuds, midges, and the occasional dry fly when fish are podding up and feeding. Congratulations to Rick with the catch of the weekend! This is why we love to fish in winter! End of Fall & Winter Fishing Special! It looks like Fall is on its way out and Winter has finally arrived with sub zero temperatures and snow covering the landscape. The fly fishing has been very good the past few weeks with everything working from standard nymphs, streamers, and small dry Mayflies. On Sunday, fish were still podding up and slurping bugs on top of the water. You cannot beat fishing dry flies in December. Winter Special!!! For those hardy fisher people that don’t mind winter or a little cold weather, we are offering drift boat trips for $350 good through March 1st, 2012. 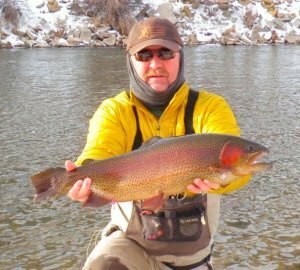 Winter is one of our favorite times to fish the Bighorn as it does not freeze over and the fishing remains good. The key is to dress warm and let us take care of the rest! Fishing on the Bighorn (Wedding of the Waters) and the Wind River have been outstanding lately. The river is back into its old form and Fall is right around the corner. Our guides have been using annelids, stone fly nymphs, streamers, and standard dry fly patterns. Seems like the fish are happy and hungry since the flows have dropped. It was a perfect time to take my family and get them hooked into some nice Rainbows. Yesterday, clients Russ and Sherrie landed several fish over 20 inches. Smaller healthy fish have been caught too, and it is nice to see the up-and-comers packing on meat and re-supplying the trout population.